Dancers representing the Virgin Islands participate in 2008's D.C. Caribbean Festival. After weeks of speculation as to whether D.C. Caribbean Carnival will take place because of financial woes, the show will go on. Well, sort of. The parade that typically marches down Georgia Avenue won’t be in D.C. this year. Organizers announced that the D.C. event will join with Baltimore’s annual Caribbean Carnival/Festival for a parade taking place July 14 at Baltimore’s Lake Clifton Park. 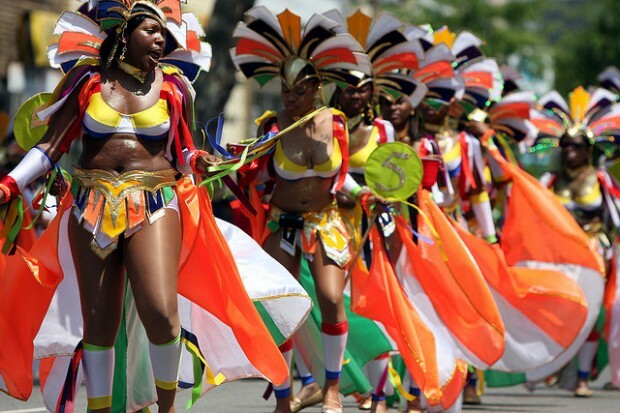 D.C. Caribbean Carnival usually holds a Pan Jam, with steel bands and costume judging. That will take place in Bladensburg, Md. during June 23 and 24, the original date of the festival. The annual parade has been cited as a boost for businesses up and down Georgia Avenue, many of whom protested last year when the route was cut short (again, due to financial troubles).